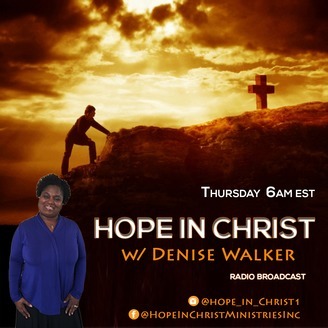 Hope-in-Christ with Denise is a show where I share devotionals, encouragement, Christian book talks, interviews with Christian authors, Biblical study topics, youth mentoring topics, and more. All with Christ as the center focus! 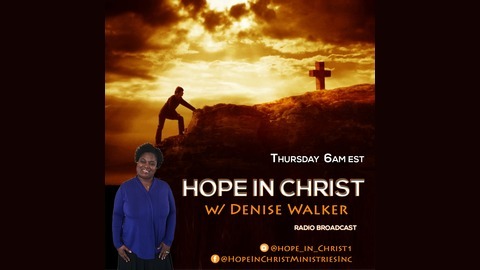 Denise M Walker Educator, Blogger, Reviewer, Devotional Writer, Proofreader, Editor www.hope-in-christ.com. Do you believe that God can do anything but fail? Then, you don't want to miss this amazing interview of two powerful testimonies. Jacqueline Goodwin and Keiaundria Wilson both share their journey to authorship and how God has worked miracles in their lives. Click to listen.